David W. Polsky is a life-long resident of New Jersey, Admitted to practice law in 1991, he is 20+ year veteran attorney who is well known and respected by the Judges and Prosecutors in the Courts where he appears. He provides quality, affordable legal representation to those seeking help with a wide variety of legal needs including but not limited to; DUI/DWI and traffic violations, criminal charges, white collar crimes and expungements, motor vehicle accidents and license reinstatements. He prides himself on truly caring for his clients during these hard times, and working diligently to get the best possible results for his clients. He will always handle each case he accepts personally, and will never assign a matter to another lawyer to handle. Before starting his own law firm in 1995, Mr. Polsky worked as a defense attorney for Liberty Mutual Insurance in Northern New Jersey. David is a member of the New Jersey State Bar as well as The New Jersey State Bar Municipal Court Section and is President of the Ridge Homeowner Association. David received two undergraduate degrees from Syracuse University, with one degree coming from Syracuse’s prestigious New House School of Communications. He received his J.D. law degree from Rutgers University, and during this time had internships with a Federal Judge in the 3rd Circuit Eastern District and the New Jersey Attorney General’s Office, Criminal Division. 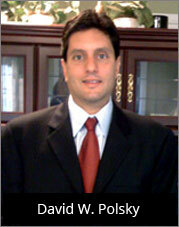 Upon graduation David did a clerkship with a Superior Court Judge in Passaic County. When not defending his clients in New Jersey Courts, David W. Polsky is a husband, father of three children, an avid bicyclist, animal lover, skier and all around sports fan. He is involved in raising awareness and money for both Breast Cancer and Alzheimer’s Research, as he has had family members afflicted with both of these terrible diseases.